Spire.Spreadsheet for WPF is a professional spreadsheet component for WPF development. Compatible with Excel, Numbers and any other XLS-based Spreadsheet program, Spire.Spreadsheet for WPF enables developers/programmers to directly read, write, edit and customize spreadsheet files from their WPF applications. Spire.Spreadsheet for WPF is a standalone WPF component. Developers/programmers can directly perform a wide range of easy-to-use functions without any dependency on Microsoft Excel. It enables developers/programmers to perform operations on Excel 97-2003, Excel 2007 and Excel 2010 in C#,VB.NET. Spire.Spreadsheet for WPF is a totally standalone WPF component. This WPF spreadsheet component has no dependency on Microsoft Excel or any other 3rd party tools. Spire.Spreadsheet for WPF supports Excel 97-2003, Excel 2007 and Excel 2010 even when they are encrypted. Users can easily load Excel file from folder, stream and byte array. It also supports changing zoom view from 100% to 400%. 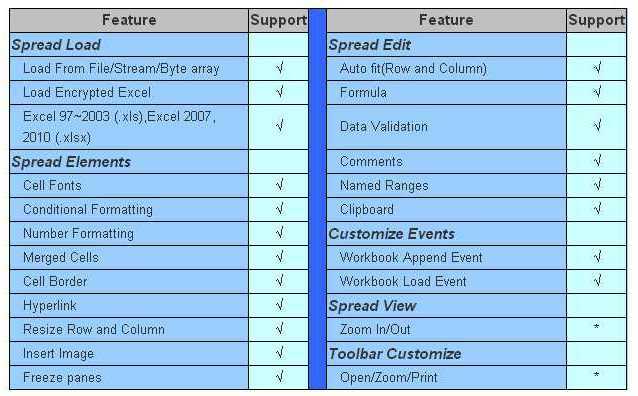 Spire.Spreadsheet for WPF supports such a wide range of Spreadsheet editing features as: Customizing column and row; Managing formulas in the excel file; Run-Time Validation; insert comments in Excel; All the clipboard operations like cut, copy and paste even with formulas etc. Spire.spreadSheet for WPF also performs well on import data form Data table to Excel. With Spire.Spreadsheet for WPF, developers/programmers can effortlessly manage Spreedsheet elements. You can resize column width/row height and set styles & formats like: cell fonts and borders, conditional formatting, and number formatting etc. Spire.Spreadsheet for WPF also supports images, freeze panes and hyperlinks. Spire.Spreadsheet for WPF enables developers/programmers to customize Toolbar as well as optimize workbook append/load events.